Amidst the business of packing and moving home a fortnight ago I was fortunate to have the weekend away, visiting my parents for a day trip to the Knitting and Stitching Show in Harrogate. Having only visited the show once before I remember becoming absorbed with shopping – failing to fit in the art exhibitions as part of the show. 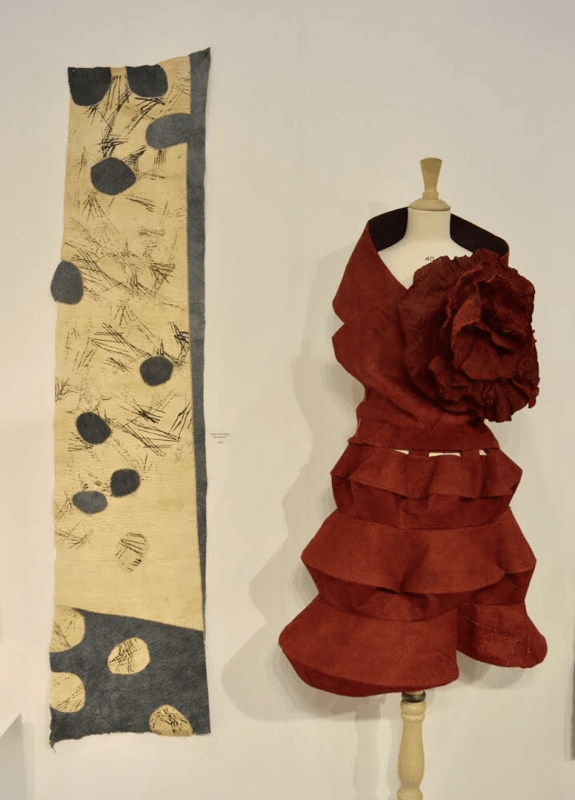 This year I had a plan – inspirational textile art first, then shopping!! 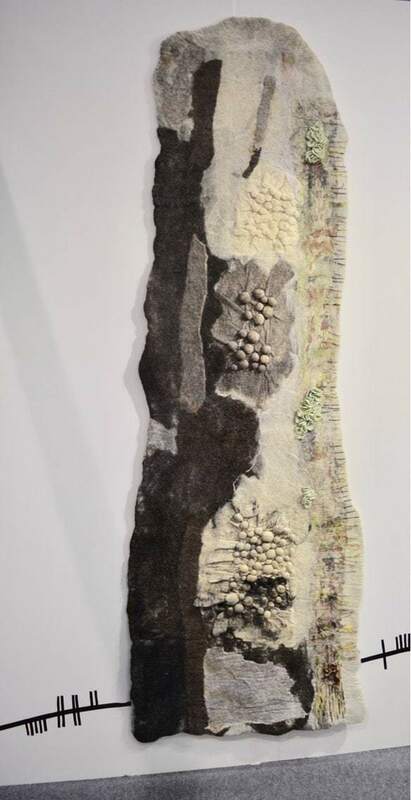 My photographs are not the best due to the artificial lighting but I am going to share them anyway, I hope you are as inspired as I.
Sarah’s abstract felt wall hangings are stunning. The details in each, the three dimensional qualities are truly inspiring. She works with fleece sourced direct from UK farmers. I was shocked to learn that farmers find it hard to sell their fleeces, often burning them. How encouraging that we can learn to felt using free materials, reloving and repurposing. 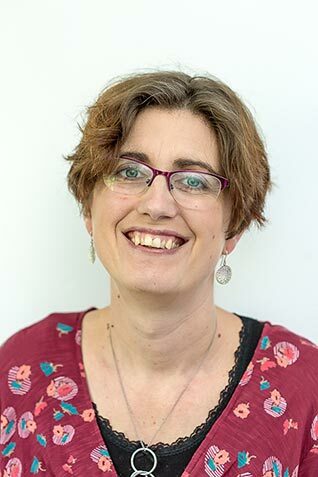 Sarah blogs here, plus she teaches felting, find out about her courses here. This is a fascinating project, beautifully displayed. 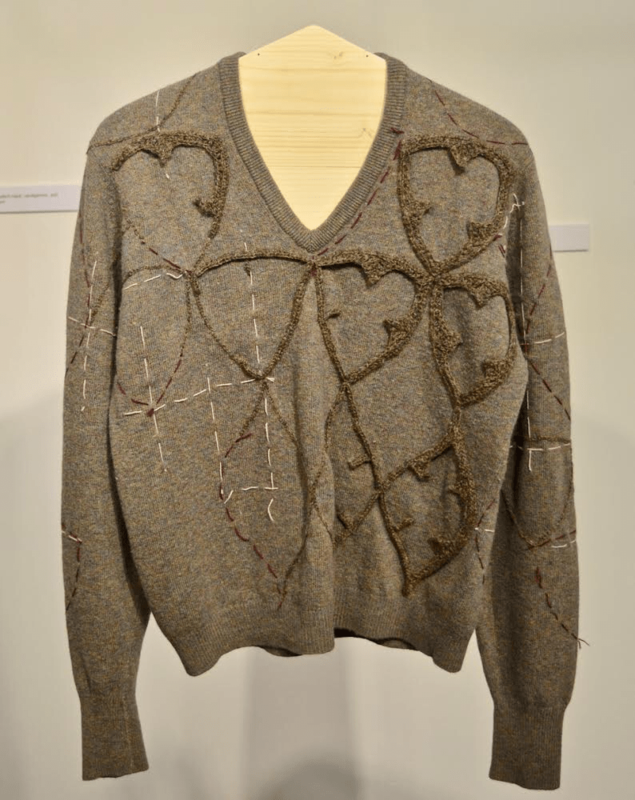 The project encourages you to think about altering/mending/embellishing pre-existing knitted items. 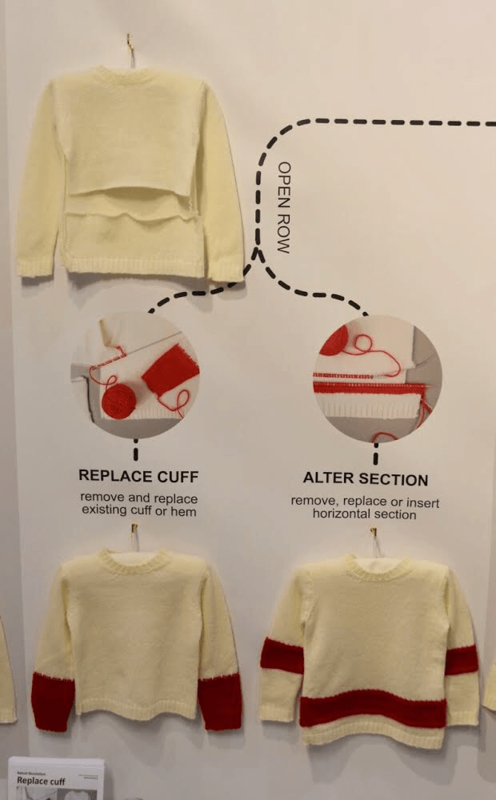 The stand showed lots of different ways to change a plain knitted jumper. I feel inspired to give it a go – not to be intimidated by altering an old sweater, be it changing it into a cardigan, reknitting a sleeve with a different colour. 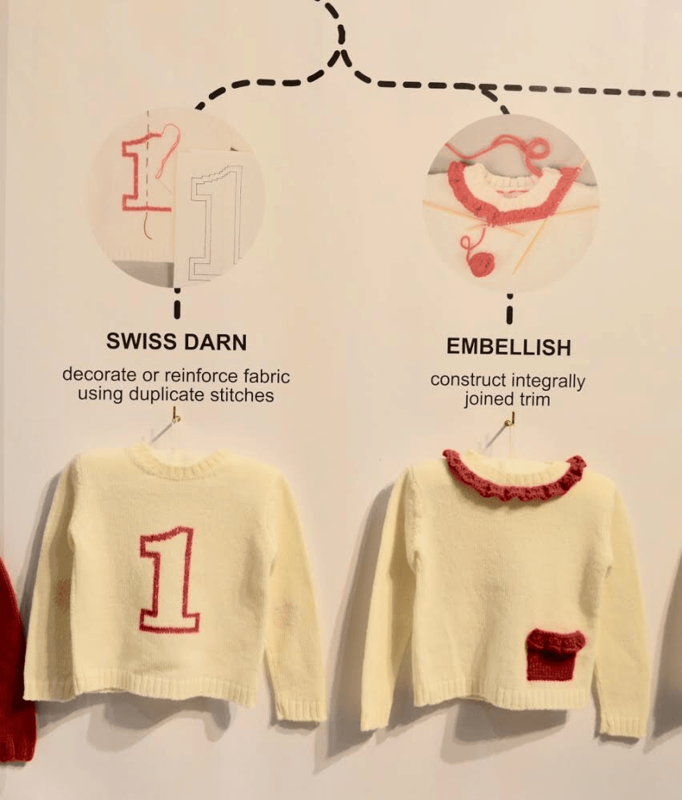 There are so many different ways you can alter a worn sweater. You can find out more about the project here. Not only were their cream knitted items transformed with red wool demonstrating many different techniques with how to leaflets to take away, there were also some fun altered sweaters. I am tempted to keep an eye for wool sweaters in charity shops. Jose and Bobby coming from very different artist backgrounds have joined to together to promote the use of bark cloth. 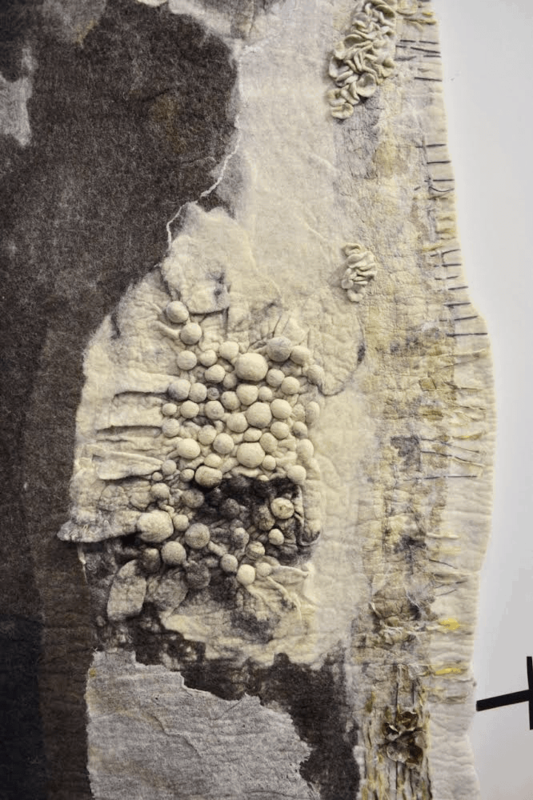 In 2015 UNESCO recognised bark cloth as the oldest cloth made by man. 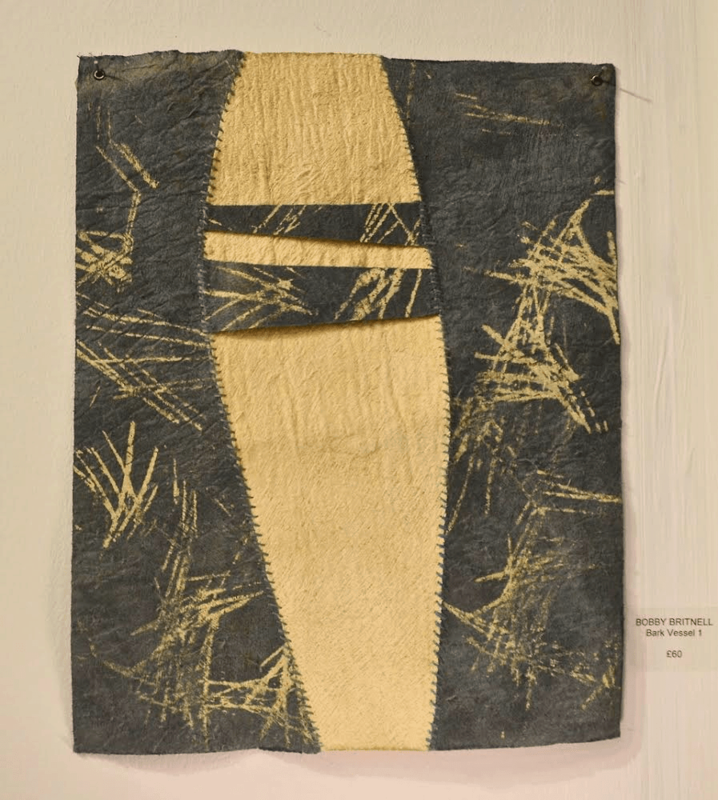 The project looked at the use of bark cloth in fashion as a textile art medium. Sadly in the house move, I have mislaid the literature I picked up about the project, so apologies this is a little sketchy. Not only was their stunning professional artists work on display to inspire there was an extensive area for the Embroiderer’s Guild to exhibit. Their exhibition inspired by books was so varied and inclusive. Such a variety of interpretation of the theme in many different techniques. I came away delighted to feel that the event was so inclusive, anyone can have a go at knitting and stitching and enjoy the process. I so enjoyed meeting exhibitors. Seeing their stands early in the day gave an opportunity to chat, ask questions and appreciate their inspirational work. If you would like to see the dress I wore, read my post here.